JMW: Hello. This is Jean-Marie Ward for BuzzyMag.com. With me today is best-selling author George R.R. Martin. Welcome, George. George R.R. Martin: Hi. Glad to be here. JMW: We’re so glad to have you here. You’ve got so many things going on in your writing life. What prompted you to get into the theater business? George R.R. Martin: Well, it was barbecue, actually, was how it started. I went out one day to pick up some barbecue at a local restaurant in Santa Fe, New Mexico where I live. And I was leaving the barbecue place with a couple slabs of ribs for myself and my wife and our friends. And I went out the back way. And when you go out the back way from this particular joint, you find yourself facing the Jean Cocteau Theater, which is this iconic little art theater in Santa Fe that has been there since 1984, but had been closed since 2006. It’s only about ten minutes from my house. And I saw it and it had a big “For Sale” or “Lease” sign on the front of it. And I thought “You know? Why doesn’t someone reopen that place? I love that little theater.” I saw so many movies there. I saw Woody Allen movies there and Spike Lee movies there. I saw the Rocketeer there. I have great memories of going to the Cocteau. Why doesn’t somebody reopen that? And then it occurred to me “Why don’t I reopen that”? So I got home and just called up my realtor. And said “You know, the building with the Jean Cocteau in it is sitting there and it’s largely empty. Find out how much they want for it.” And I was startled to discover it had been on sale for three years. The price had been dropping and dropping. And I looked into it and said “What the hell”? So, I bought it and we reopened it on August 9th. The community really seems to have embraced it. I’ve gotten so many great compliments from people who have thanked me for reopening the Jean Cocteau. We’re showing a very eclectic mix of films. Art house films and science fiction films and fantasies. Old films, new films, some black and white films. We’re going to do some silent films in the mix. We’ve got midnight shows. We’ve got our first kiddie matinee coming up with Abbott and Costello Meets Frankenstein. Kids under 12 for free. And we have live music and we’re going to have magic. So, it’s a real asset to the community, I think. And it’s fun for me and it’s giving employment to a dozen people, which is also very good in this economy, I think. I’m proud of what we’re doing with the Jean Cocteau. I hope it keeps going for a long, long time. JMW: But I’m curious. What was the biggest surprise you encountered in bringing this theater back to life? George R.R. Martin: I don’t know that I can call it a “surprise,” but I’ve certainly learned a lot about how the business works that I did not previously know. I had worked in television and film for decades going back to the mid ’80s. I’ve written movies, I’ve written television shows. But all of my experience has been on the creative side of it, the side of making the movies and making the television shows. I knew absolutely nothing about the whole distribution and exhibition side of it. I’m seeing the business now through a very different lens from the lens at the other side and understanding what happens and how movies get into the theaters. And how people make money off that with increasing difficulty, by the way. I think the single screen movie theater like the Jean Cocteau, the small theater that’s not part of any chain, is an endangered species. And those of you who are viewers who have them in their towns should support them because they’re going out of business from coast to coast, unable to compete with the economics of the huge 27-screen megaplex at the mall. And I love those little theaters. I grew up watching movies in the small theaters of Bayonne, New Jersey. The DeWitt, the Lyceum and the Plaza, all gone now. And great ’30s movie palaces. So many of them are derelict or gone or have been knocked down. These are treasures. These are the cathedrals of the cinema. We should be preserving them. And the little theaters in the little towns, too, were once the hearts of those towns. And now, the heart has been ripped out. Netflix is great, television is great. But there’s something special and unique and exciting about watching a movie with an audience. It’s a communal experience. It’s something that you all share together. And you lose that when everybody is just watching the same movie, sitting in their Barcalounger at home in their underwear. So, go to your local movie theater. Support the local cinema. JMW: Getting back to Ice and Fire. Because I know our viewers will not forgive me if I don’t ask you a couple questions about that. When did you realize the saga was going to take your career in a new direction and lift it to a new level? George R.R. Martin: Well, it’s actually lifted it to like six new levels. I think everyone comes as a little bit of a surprise to me, except maybe the first one. When I first wrote this in the early to mid-’90s, completed and delivered the first one in ’95 and it came out in ’96, my main hope was that it would get my career back on track. Because my career as a novelist had been derailed. I had a very healthy career in science fiction and fantasy in the late ’70s and early ’80s with a series of novels, each of which have been more successful than the one before. Until I wrote my fourth book The Armageddon Rag, which, while critically acclaimed, was a very poor seller. And the commercial failure of The Armageddon Rag essentially made me unsaleable. Nobody wanted my fifth novel. I went to Hollywood and worked in television on “Twilight Zone” and “Beauty and the Beast” partly out of choice because it was an exciting new opportunity. And also partly out of necessity, because I couldn’t get anyone to buy the fifth book that I was writing. So, after ten years there, I was kind of returning to prose with Ice and Fire and of course, I was hoping that The Armageddon Rag experience would not be repeated. Because if it had been, I don’t know, I might have had to change my name or start my career all over again. The book field is like Hollywood in some ways. It’s merciless here. You’re only as successful as your latest book or movie or television show. But thankfully, the Game of Thrones and the books that followed Game of Thrones were successful and not only restarted my career but as you say, took it to a level of popularity and sales that none of my earlier books had achieved. And then things just kept going up. I began to make bestseller lists for the first time in my career with the second book. With the fourth book, I hit number one on the bestseller list for the first time. With the fifth book, I lived on the bestseller list for like two years. And with the television series, everything has gone crazy. So, it’s not just been one new level. It’s been a series of new levels and it’s all been very exciting. I don’t expect any of it. I don’t even try to think about any of it when I’m writing the books. My concern is with Westeros and the world and the characters and telling the best story I can. And then I turn it over to my agents and my editors and my publishers and they take the ball and carry it from there. JMW: What about the story and the characters do you think resonates so strongly with people? What is the key element that has made this one the big one? George R.R. Martin: I think it’s the characters. My mantra as a writer has always been William Faulkner’s Nobel Prize-winning speech where he said that the only thing worth writing about was the human heart in conflict with itself. That’s what I try to write about. That’s the fundamental of all great fiction. And it doesn’t matter what genre it’s in. Whether it’s literary fiction, a mystery novel, historical fiction or science fiction/fantasy. Whether it’s television, film or books, it’s the characters that draw the reader into the stories. It’s the characters that make it come alive. The human heart in conflict with itself. Be it on a spaceship or in a castle or on the mean streets of Raymond Chandler. The human heart in conflict with itself makes the story come alive. And that’s certainly what I try to grapple with. JMW: On a far lighter note, are you planning to get in touch with Stevie Nicks about her fan fiction poetry? George R.R. Martin: No, but it would be great if she you know came and sang on a television program or something like that. Of course, I’m a big fan and always have been. So, it’s been very exciting with Stevie Nicks and with some of the other people who have come to the books or the TV series. And their enthusiasm is really cool. JMW: You mentioned earlier, your years in TV, on “Beauty and the Beast”, “Twilight Zone” and others. What was the biggest and most important takeaway from that experience for your novels and stories? George R.R. Martin: You know I think it did influence my style to some extent. I picked up certain techniques. I think working in television and film really improves your dialogue. If you look at the dialogue in my novels beforehand and later, I think the rhythm is much more compelling, the cadences. Also, there’s a lot about the structure, I think that makes a book more readable. Television, in particular, because of the commercials, has developed this act break structure. Where you may have a television show that is four acts or five acts. And each act ends on an act break, because then you have cut to the Tidy Bowl commercial or whatever and you want the reader to come back after that. Now, an act break is more than a cliffhanger, although a cliffhanger is a good act break. But it’s something, it’s a reveal. It’s a moment of jeopardy, it’s a moment of rising tension or it’s a revolution of a subplot or something like that. There are many different ways to do an act break. But the whole point of the act break is that you end it so that the reader wants more. And then, they come back after the commercial. Well, the same technique in a huge work like A Song of Ice and Fire, with its multiplicity of viewpoint characters, it’s also very effective. You read a Tyrion chapter and it doesn’t just end, it ends with an act break. It ends with something that makes you very eager to read the next Tyrion chapter. Except you don’t get the next Tyrion chapter right then. Then you get a Daenerys chapter and you read the Daenerys chapter and that ends with an act break. 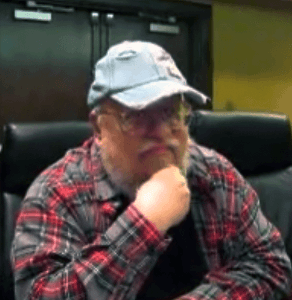 Now, you want the next Daenerys chapter, but you don’t get that. Now, you get a Jon Snow chapter, etc. And you’re constantly driven forward wanting to know what happens to these characters, what follows the act break that you just went out on. That’s a very valuable technique for I think any storyteller that television writers have perfected. JMW: Speaking of act breaks and looking forward and waiting for things, what can your fans look forward to in 2014? George R.R. Martin: Well, in 2014, I have a lot of stuff coming out at the end of 2013. But in 2014, there’s two big new anthologies that I’ve done with Gardner Dozois. There’s Rogues, which is another of our huge course genre anthologies and there’s Old Venus, which is the sequel to Old Mars which came out in 2013. Stories, sort of retro science fiction about Venus. Not Venus as it actually is, but Venus as we once imagined it would be. The watery world full of swamps and seas and dinosaurs. So, we’ve got 15 incredible science fiction writers to contribute stories to that. And for Rogues, we have writers from every genre and from literary fiction, mystery fiction, historical fiction, science fiction and fantasy. All over the map, writing stories about rogues and cads and ne’er-do-wells and swindlers and grifters and all of those other enticing colorful personalities. There’s a new Wild Cards book that should be out that year. Lowball, the 23rd volume in the series, I believe it is. And that will be out sometime in 2014. And the big one, probably The World of Ice and Fire. The large coffee table concordance lavishly illustrated with the history of Westeros and the seven kingdoms and all of the surrounding lands. History, geography, culture, legends, everything you want to know. Illustrated by some of the top fantasy artists in the world. JMW: Great. Anything you’d like to add? George R.R. Martin: Keep reading. JMW: Works for me. Thank you, George. And thank you for BuzzyMag.com.